Shhh… Use This One Trick for Healthier Cookies. And now for a cookie recipe! I know what you’re thinking. You’re wondering if I might be a little schizophrenic. I’m blasting sugar’s reputation one minute and trotting out a baked sweet treat recipe the next. My son had invited two friends from school over to our house for a sleepover. We’re talking teenagers. Tough audience. Nice kids who would stare down a bowl of tofu chili with blood in their eye. So I did the only thing I could think of. I caved. Frozen pizza. Which left them wanting more, of course. We’re talking 8th grade boys here. They wanted dessert, naturally. Apples and oranges were not going to placate this rowdy crowd. It was a party of sorts after all. This is a recipe I recently modified to make just a bit more nutritionally friendly. I used a simple trick. One you can use at home with your favorite cookie recipe. Use 1/4 less sugar. It works! Use a quarter less sugar than your recipe calls for and no one will know. My original recipe called for 3/4 cup of sugar so I used 1/2 cup instead. I also cut the amount of chocolate chips in half in this version. In a large bowl, cream butter and sugar until fluffy. Beat in egg. Mix in vanilla. Whisk next 4 dry ingredients together. Add to butter and beat until just mixed. Stir in millet and chocolate chips. Bake on a greased cookie sheet for 9-10 minutes. Those cookies were barely out of the oven before they were gone. No need to mention that they contained less sugar and more whole grains than the average cookie. My son loves the pleasant crunch of the millet and apparently the others did too because I heard nary a complaint. 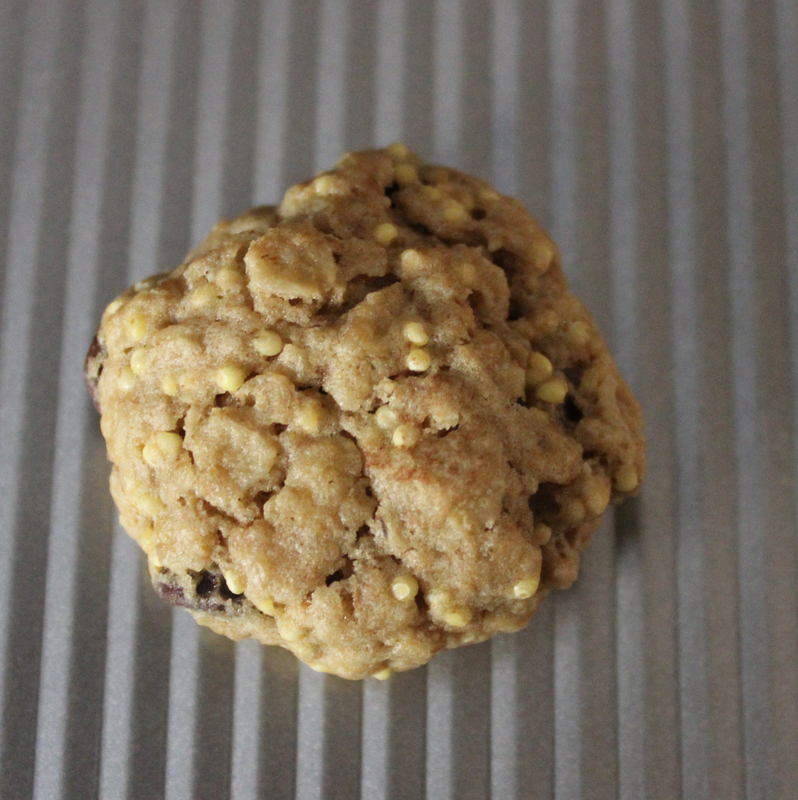 This entry was posted in Recipe, Sweet Treats, Whole Grain and tagged chocolate chip oatmeal cookies, millet, reducing sugar in cookie recipe by Robin Lewis. Bookmark the permalink. mmm. sounds like a good recipe. Thanks Lucia. Maybe you should be posting recipes for all those delectable looking dishes you prepare… You’re quite the cook. Chocolate chip cookies with less guilt! I can’t wait to try it! I’m wondering the benefit of the millet here. More fiber? Well, millet is a whole grain. It’s also high in manganese, phosphorus and magnesium. And if you chocolate chips are at least 75% cocoa, those cookies get even better. All in moderation, of course! Thanks for stopping by. Let me know how they turn out. As in, what do the kids make of them! Also, you can cook the millet just as a grain dish. I like to add a quarter cup or so to the other grains when I cook them–mix it up.